It's the last one! La Gazette Internationale is publishing its final issue, ending a long adventure begun in 2011, which ventured as far afield as China – with issues published in Mandarin at the time under the leadership of Stéphanie Perris, which could be viewed for free. But our readers needn't worry: they will be able to go on reading us in English. 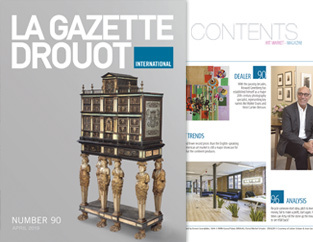 Starting in May, La Gazette Drouot will be moving decisively into the digital age with the launch of a new bilingual website, as the current site has reached its limits in browsing terms. Here they will naturally find announcements of the main public auctions within and outside France, as well as the latest news of the art market, a focus on prominent figures and content ever-more slanted towards the international. To assist us with this new departure beyond our linguistic borders, we have New York gallery owner Howard Greenberg and curator Flavin Judd (son of the Minimalist art leader), and we take a look at the Latin American art market in Europe. So see you soon online! Artsy is now ten years old, with more than $100 million from private equity firms and famous investors. While its name and fame grew among art collectors, the profit margins never did. The business model seemed to change every couple of years; going from artificial intelligence-driven art predictions to an online hub for galleries and finally to yet another online auction company. More recently, the departure of Sebastian Cwilich, co-founder and chief operating officer, followed by lay-offs and reports of a data breach, all has many observers wondering how long the platform can survive. In April, naturalia will be competing with more traditional fields represented by a collection of earthenware from Gien, Aristophil manuscripts, an imperial chair and a rare study for a frieze by Vuillard. At the last minute, a cabinet attributed to Pierre Gole, which fetched nearly €1 million, stole the limelight from a feasting lion by Bugatti: until then the top bid at Drouot during March. During the exhibition devoted to his father, Donald Judd, which he is curating at the Thaddaeus Ropac gallery, Flavin Judd gives us a frank picture of the artist and the man, and talks about the Judd Foundation. Since Clare McAndrew's defection and the end of her macroeconomic reports, TEFAF has regularly sponsored a thematic study on a precise field. This year, Professor Kejia Wu looks back on the construction of the Chinese art market. The Latin American art market has its own rhythm. Though with a lower profile and fewer record prices than the English-speaking and European markets, it is still a major showcase for discovering the very best of what the continent produces. The Porcelain Room of the Santos Palace in Lisbon is famous for its ceiling, laid out at the end of the 18th century with "blue and white" plates from China. The Musée Guimet is presenting a 3-D reconstruction.